﻿Education and philanthropy are kindred spirits. When they are both doing what they do best, they nearly become the same thing. They impart knowledge so others can benefit from it, and build on it. If we had only one metric for a philanthropic endeavor to measure its impact, we might well ask how well are the intended beneficiaries being educated? Think of the familiar distinction between charity and philanthropy in terms of the proverb: give a man a fish and he eats for a day, teach a man to fish and he can feed himself for life. This is what we try to achieve in both education and philanthropy – to build knowledge and capacity so subsequent generations can go further, making improvements in the human condition and advancing civilization. Sometimes we have trouble keeping pace, and not everyone benefits. But progressive improvements that build on each other are what is intended by both education and philanthropy. Clearly not all philanthropy is devoted to formal education, nor should it be. But when you look at the range of philanthropic projects it is hard not to see an educational process in most of the systematic interventions we craft to improve the world. From eradicating disease to better supporting the homeless, to preventing domestic violence to protecting animals and the environment, if educating the beneficiaries is not the ultimate goal, gathering a constituency to address the cause will always involve education. But it is not only philanthropy rightly understood and effectively practiced that involves a lot of education. The reverse seems to hold as well. When true to itself, education involves giving. Most of us have had the experience of a transformational teacher who inspired us with passion or unlocked a hidden ability within us. It was a creative act, one we remember for making us who we are. Neither the motivation nor the effect of the genuine teaching moment comes from anything but the joy of giving someone else the means to thrive. Neither compensation nor coercion makes this exalted process possible. It is giving that is its own reward. 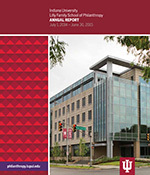 One of the Lilly Family School of Philanthropy’s faculty, Assistant Professor Genevieve Shaker, recently published an edited volume, Faculty Work and the Public Good, that looks at the various unexamined and uncompensated ways in which teachers give of themselves to create learning communities and create vital teaching institutions. Again, it is neither money nor the command of an authority that unleashes this good will, which is often the cultural glue that binds together the communities that make our great schools and colleges. The close affinity between education and philanthropy is often traced historically to the role of the new social sciences in informing the first large foundations in the U.S. at the beginning of the 20th Century. I would hope that another phase in the rich interplay of education and philanthropy has begun with the emergence of philanthropic studies and schools of philanthropy as we seek to explore and strengthen the bonds between education and philanthropy. One of our goals in creating this field is to focus directly on education as a way of improving philanthropy, and it is hard to argue with education as a recipe for progress. Do Foundations Make a Difference? In a November 10 free public lecture in Indianapolis, “Can Foundations Know If They Are Making a Difference? 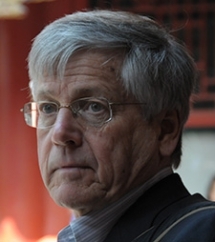 Navigating between Ivory Towers and Performance Metrics,” Kenneth Prewitt, former Rockefeller Foundation executive, former director of the U.S. Census Bureau, foundation scholar and Carnegie Professor of Public Affairs at Columbia University, will explore this question. The talk will be preceded by a reception and followed by a panel discussion among local philanthropy leaders and faculty, including: Dr. Dewayne Matthews, vice president of strategy development, Lumina Foundation; Christie Gillespie, vice president of community impact, United Way of Central Indiana; and Dr. Catherine Herrold, assistant professor of philanthropic studies, IU Lilly Family School of Philanthropy. 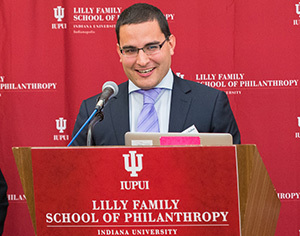 The event is presented under the auspices of the Stead Family Chair in International Philanthropy at the IU Lilly Family School of Philanthropy. In an experience that resembled a scene from Dr. Seuss’s Oh the Places You’ll Go more than one from graduate school, Ian Ermatinger-Salas met a larger-than-life figure on a yellow motorbike who is bringing Ian’s dream of serving others to life. International “kindness advocate,” adventurer, bestselling author and TV personality Leon Logothetis presented Ian with a $7,500 scholarship for an international service opportunity of his choice though UBELONG, an international volunteer agency. It includes $2,500 for him to give to an organization he encounters during his travels. Logothetis is a former London broker who traveled around the world relying solely on the kindness of complete strangers for food, gas for his bike and a place to sleep. The Kindness Diaries: One Man’s Quest to Ignite Goodwill and Transform Lives Around the World details that journey. He recently spoke at the Lilly Family School of Philanthropy on his “Giving Back” tour about the power of kindness and human connection. Ermantinger-Salas was one of six students at the school competing for the scholarship via brief presentations on their philanthropic and geographic interests. The master’s degree student focused on his passion for providing English language education to vulnerable populations, including refugees and migrants, and for refugee assistance and aid. He noted that while he focused on the current refugee crisis in Syria, there are numerous, similar crises occurring around the world as a result of war and terror, natural disasters, or wealth inequality. In each of these cases and others, English language education can help give desperate, displaced people opportunities to succeed. The past year was an exhilarating chapter in the life of our school. We invite you to take a look at our Annual Report 2014-2015, highlighting many exciting opportunities and advances. Thank you for your dedication to our students, our school and our mission, and for all you do to help make these successes possible.